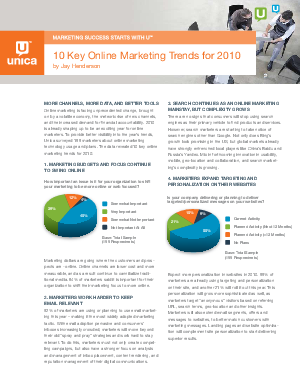 Download 10 Key Online Marketing Trends for 2010 to reveal what is shaping the online marketing landscape. Distilled from a global survey of online marketers, you will learn: where marketing dollars are being spent, how to keep email relevant, about growing search complexity, why personalization is important and where mobile marketing is headed. See how your peers are (and will) use online marketing to reach their customers and prospects in new ways. Register now to be on top of the trends.